Changeling, drop me a line sometime! I've been trying to get in touch with you for years. Go over to http://noname.c64.org/csdb/ and PM me there. Exchange emails or something. Not sure where you are/what you're doing anymore and would love to chat. yep, copy/paste from exotica. Anyway, good memories, Abyss dudes! 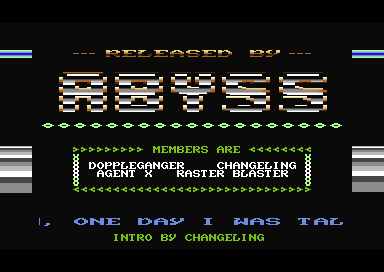 looks like a copy/paste txt to me :) Hey Changeling, I always liked those Abyss releases! Sorcerer (import, 88), Whiplash (01-02/88). Boards; THE CONCENTRATION CAMP (usa, 01/88). Abyss was an usa-based demo and cracking group. code: Changeling, gfx: see review, music: see review. graphics, but comes across as an early, fair demo. No frills, though. Raster Blaster was welcomed as a member in a part dated 04.01-88. Hardrock (1988, File, 3 parts). code: Raster Blaster, gfx: uncredited, ripped, music: ripped. credited. Design is nothing special, just average, and so is the code. Ah, the famous Super Mario intro. Great stuff, good music too.